District Health Information Software 2 (DHIS2) is an open source, web-based health management information system (HMIS) platform. Today, DHIS2 is the world's largest HMIS platform, in use by 67 low and middle-income countries. 2.28 billion people live in countries where DHIS2 is used. With inclusion of NGO-based programs, DHIS2 is in use in more than 100 countries. The core DHIS2 software development is managed by the Health Information Systems Program (HISP) at the University of Oslo (UiO). HISP is a global network comprised of 11 in-country and regional organizations, providing day-in, day-out direct support to ministries and local implementers of DHIS2. The DHIS2 platform boasts data warehousing, visualization features, and the possibility for data users and policy makers to generate analyses from live data in real-time. DHIS2 development is coordinated by HISP at UiO, with developers located in Norway, India, Vietnam, Tanzania, Ireland, and the United States of America. Until 2011, DHIS2 was developed and maintained by PhD students and faculty members at the Department of Informatics at UiO, working closely with the users through implementation and research projects. From 2012, in response to the increasing demands, the core software development organization was professionalized by hiring full-time developers, architects and project managers. The result was that new user demands were captured and introduced through professional quarterly release cycles. From the very beginning, only generic requirements (e.g. requirements relevant across different geographical regions), were implemented in the core, while the flexibility of the platform allows for idiosyncratic implementation locally. State-of-the-art tools are used to document and prioritize requirements from the variety of stakeholders involved. From the beginning, priority has been on embracing new technology while also ensuring a robust solution that will work in resource-constrained settings. Many technologies are used, including the opportunity to report by SMS from feature phones. DHIS2 was the first governmental information system south of Sahara to scale online nationally (in Kenya in 2011). The new DHIS2 Android App allows offline data capture across all DHIS2 data models. Each country has its own “instance” of the DHIS2 platform with full ownership of the application and data. In collaboration with experts in the DHIS2 community, ministries of health configure their own information system on top of the generic platform. A crucial aspect of DHIS2-implementation is that data ownership rests with each user institution. This implies that each user institution needs to make decisions and find solutions related to storing data. The HISP-network provides guidance, but appropriate solutions will vary depending on factors such as capacity to maintain servers, regulatory requirements among others. This includes general data and privacy regulations as well as the day-to-day practices of for example user and access administration. To ensure that implementations result in sustainable health information systems which are used to support decision-making, HISP-UiO spends significant resources on building institutions and commitment. To date 50 PhD students from the Global South have graduated within HISP. These experts form the base for supporting the various regions and home countries. Regional HISP organizations also build local DHIS2 capacity through the DHIS2 Academies (a gathering and training of regional HISP active members). To date, over 80 DHIS2 academies have been conducted, training nearly 4500 learners on everything from DHIS2 analytics use, to system configuration, and even advanced application development. The free DHIS2 online academy has also supported local trainings since 2017, and has trained 5054 learners from 102 countries on DHIS2 fundamentals. Through direct involvement in the form of implementation support, trainings, and research in dozens of national management information systems, HISP has developed into a global community of thousands of DHIS2 experts. UiO plays the role as the central hub for the collective experiences, knowledge, and best practices in DHIS2 implementation. This is the largest driver of DHIS2’s long-term, sustainable use and uptake in the most resource-constrained countries. Recognizing the breadth of national implementations, global health institutions have found it useful to adopt DHIS2 as an institutional software program that allows them to align to national information systems and at the same time meet their institutional data management needs. Such users include the U.S. President's Emergency Plan for AIDS Relief (PEPFAR), Doctors Without Borders, Population Services International (PSI), and global health programs at the World Health Organization (WHO). DHIS2 has a modular, layered architecture with a strong and open application programming interface (API). This means that DHIS2 essentially serves as a data warehouse with more than 60 native applications which pull or push data stored in the warehouse to perform different functions such as data quality checks or making scorecards. Software developers, working with this kind of system architecture and stable code base, are easily able to build their own native applications in DHIS2. The widespread adoption of DHIS2 has allowed the realization of a whole series of other benefits. Recognizing its uptake, WHO endorsed DHIS2 as a global public good, and has developed data quality management apps and normative guidance to support countries in better application of DHIS2. UiO and WHO also collaborate on developing standard health apps on DHIS2 with recommended indicators and best practice for data use at country level. In December 2017, HISP-UiO was designated as a WHO Collaborating Centre for Innovation and Implementation Research for health information systems strengthening. 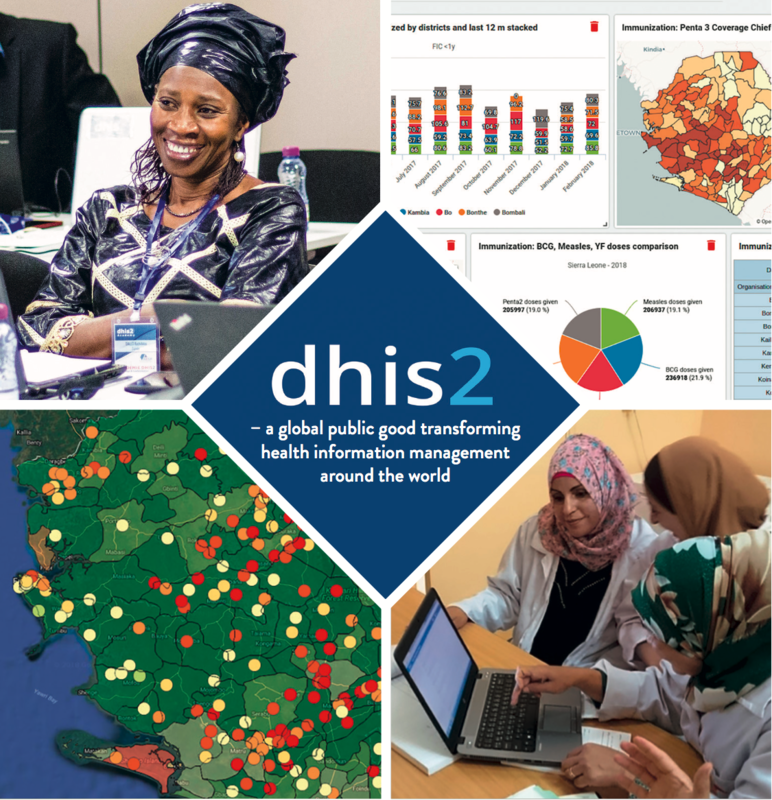 DHIS2 is well suited for a broad range of applications, notably now covering routine reporting for district, facility, and community health, education, water and sanitation, agriculture, and more. For example, in Zambia alone DHIS2 serves as the national MIS for three line ministries. Practically, this results in a critical mass of DHIS2 use skills in the Zambian government from national level all the way down to community health worker and teacher levels. This proliferation of private and public sector service providers of DHIS2 know-how makes it easier for DHIS2 to be adopted in a new sector or program. With gradual expansion of the use of DHIS2 across other sectors the potential to realize benefits of scale is only just beginning to be tapped in. Other sectors can reap a dividend of health sector expertise to serve MIS development needs across other tiers of government. The open API also makes it easy to connect DHIS2 to other external software through an interoperability layer or with a direct API to API connection. There already exists many generic DHIS2 interoperability layers, like OpenFN, and direct connection DHIS2 plug-ins for dozens of other external software, such as Tableau. More specifically, DHIS2 has turn-key interoperability with iHRIS, the most widely applied open source human resources information system, as well as OpenLMIS, the largest open source logistics management information system. The development of the DHIS2 core platform has received funding from Norad, the University of Oslo and the Research Council of Norway from the very beginning in 1994. In 2013 PEPFAR and the Global Fund committed to support the DHIS2 development together with Norad due to the footprint (30 countries and growing fast) DHIS2 had already established. Later UNICEF, CDC, GAVI, and Bill and Melinda Gates Foundation (BMGF) came onboard. DHIS2 is currently supported by Norad, PEPFAR, the Global Fund, BMGF, CDC, GAVI, UNICEF, WHO, and UiO. The current yearly budget is 88 mill NOK (11 million USD). This funding has enabled the HISP project to expand and sustain over time, to have the flexibility to explore the newest of technologies, to develop a network of experts in the countries and regions, and to commit to continue to deliver a stable and generic core platform. It is expected that more countries will adopt DHIS2 simply because all their neighbors are using it. However, even if there is no increase in the numbers of countries using it, each country will graduate towards a larger and more intensive application to include more national programs and increased data complexity. Patient-linked-data and more data collected through mobile devices expand the potential for – but also the complexity of – data analysis and use. This means that countries and institutions implementing DHIS2 will need to deal with rapidly expanding data storage requirements and other data governance issues.